The Velda Brilliant Pyramid is a cheap and safe way of detering predators from your pond. The pyramid just floats around the pond and the sun reflects off the reflective sides, scaring the herons away. The growing heron population is an increasing problem for lovers of ponds. An adult heron has no difficulty swallowing a fish of 30 to 35 centimetres. If the heron is successful, it will come back till it has fished out the pond. The Velda Brilliant Pyramid offers the perfect solution for the heron problem. The pyramid which is floating on the water surface shines, sparkles, and reflects the daylight so intensively, that herons are frightened by it. The Brilliant Pyramid of Velda is a wonderful product to keep herons far away from a pond. The shiny pyramid will cause so much unrest to a heron by the waterside that it will fly away at once. 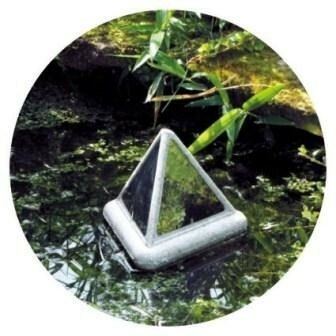 Buy one Brilliant Pyramid for 6 metres square of pond surface protection. The pyramid is supplied, including cord and weight with which it can be fixed at a distance of 60 centimetres from the waterside.